Not long ago, William Hague was frightfully annoyed at Baroness Ashton's success at getting her EU foreign office the right to speak on behalf of all EU member states at the United Nations. He promised to ensure that the EU foreign office's involvement in the UN was "strictly limited" to attending the General Assembly. A Cast Iron Guarantee™ from Wee Willy Vague made in the House of Commons to concerned MPs from both sides of the floor. 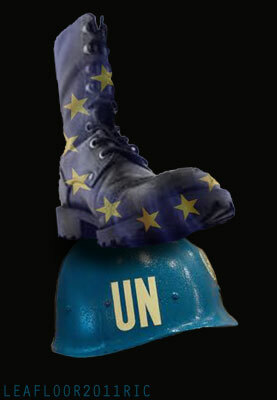 Now the EU foreign office has got itself onto 61 more UN committees and Wee Willy Vague's Cast Iron Guarantee™ to "strictly limit" the EU foreign office's influence in the UN has been proven to be as worthless as David Cameron's Cast Iron Guarantee™ to give us a referendum on the EU Constitution/Lisbon Treaty. The Earl of Dartmouth, UKIP MEP in the south west of England, warned that "the EU is diminishing Britain's influence in the world" whilst the Tory Minister for the EU and one of Cameron's close circle of europhile advisors, David Lidington, described the EU speaking on behalf of the UK in 62 UN committees despite Wee Willy Vague's Cast Iron Guarantee™ he wouldn't let it happen as a "simple technical change".